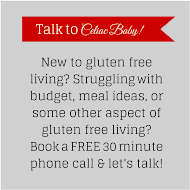 Celiac Baby! : Christmas Shopping is Done! Except for my husband's gift. But I know what I'm getting him, so the stress of finding a gift isn't there. I also have a few colleagues in my department to get a little something for, but again, I already have the items picked out. Now I can sit back and enjoy the holidays. And once I submit my semester end exams. And decide on a menu for Christmas day. And buy the groceries for said menu.